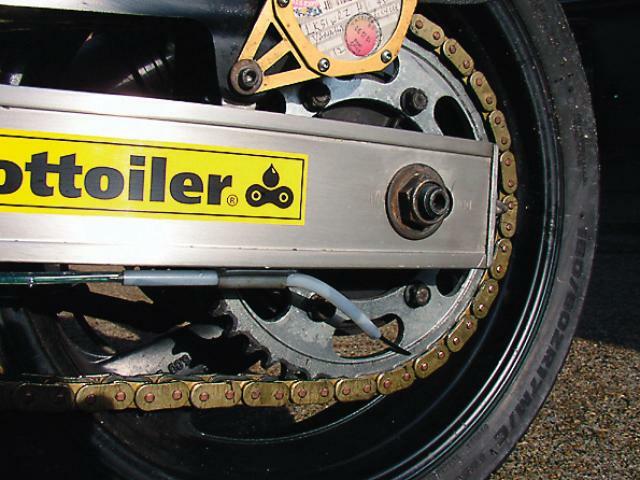 Scottoilers are fantastic inventions which can dramatically increase the life of your chain and render nasty, sticky chain lube a thing of the past. However, many people are put off buying one by the thought of fitting it themselves - all those tubes, fittings, brass bits and rubber brackets look awfully complicated. But it really isn't so hard. Trust us. It's easy to fall at the first hurdle with a Scottoiler and get fazed by the number of components in the box. Relax. You don't need them all. Scottoiler provide an incredibly comprehensive kit including a number of fixtures and fittings to fit as wide a range of machines as possible, so the first thing you need to do is simplify matters by working out which bits you're going to need and which bits you're not. First step is to work out where you're going to mount the main oil reservoir or reservoir metering valve (RMV) as it's properly called. The standard or Universal Scottoiler kit, as shown here, comes with a 50ml RMV which can be mounted in a variety of positions on the bike. If you've got a Touring kit you'll probably be wanting to mount the much larger, 400ml RMV behind the numberplate, where it's designed to be fitted. We haven't, so we'll stick with talking about the smaller RMV. The RMV can be mounted pretty much anywhere on the bike, at any angle between vertical and horizontal, providing the filler plug is uppermost, the oil feed tube to the chain is at the bottom and the adjuster knob and filler plug itself can be easily accessed for adjustment and re-filling. For the sake of neatness the RMV can be mounted under the seat or behind a sidepanel but remember, out of sight is out of mind, and if you are of an absent-minded nature it might be best to have it in full view where the oil level can be monitored more easily. Once you've decided where you want to mount the RMV, you can choose which of the mounting fixtures best suit the chosen position. The under-the-frame-rail mounting point we chose is best served by the moulded rubber mounting bracket, held in place with tie wraps. With those parts selected, we can put the remaining mounting fixtures to one side and all of a sudden the daunting pile of parts is looking far less intimidating. Once the RMV is in place you also need to mount its breather tube and air filter somewhere securely and out of the way. We found the perfect place in the recess behind the Fazer's pillion footrest hanger. Next step is to work out which oil delivery tube fitting is best suited to your bike. First, work out the best route for the tube from the bottom of the RMV to the dispenser, which will be mounted towards the end of the swingarm, near the rear sprocket. Remember the delivery tube has to have enough slack in it to allow for suspension movement. Also, avoid running it too close to hot exhaust components; repeated heating and cooling of the plastic pipe will lead to it hardening, cracking and leaking, which will render the Scottoiler ineffective. Secure the delivery tube along the way with cable ties and conduit parts supplied. If you opt to Superglue the mounting sleeve to the underside of the swingarm as we did here (Superglue is provided in the Scottoiler kit), make sure you remove all trace of road muck and old chain lube first using a solvent such as brake cleaner. Next sort out how you're going to fit the oil dispenser - which attaches to the far end of the delivery tube - to the swingarm. You've got a couple of choices. Either attach the dispenser tube with another piece of mounting sleeve Superglued to the underside of the swingarm (as we have done) or use the roughly teardrop-shaped metal mounting bracket fixed over the end of the wheel spindle and held in place with the spindle nut. Whichever method you choose, ensure the end of the delivery tube is bent in such a way that it delivers oil against the rear sprocket at a six o'clock position, approximately two milimetres above the chain's sideplates, where the centrifugal force of the spinning sprocket will spread the oil out and onto the chain itself. Once the delivery tube and dispenser are securely fastened, turn the rear wheel in both directions to ensure the dispenser doesn't foul either the chain or sprocket. The final part of the fitting process is sorting out the vacuum connection from the engine to the RMV. This is the clever bit which makes the Scottoiler deliver oil only when the engine is running. By connecting the RMV to the bike's inlet manifold via a tube, the vacuum effect created in the tube when the engine is running opens a valve in the RMV enabling it to deliver a flow of oil to the chain. 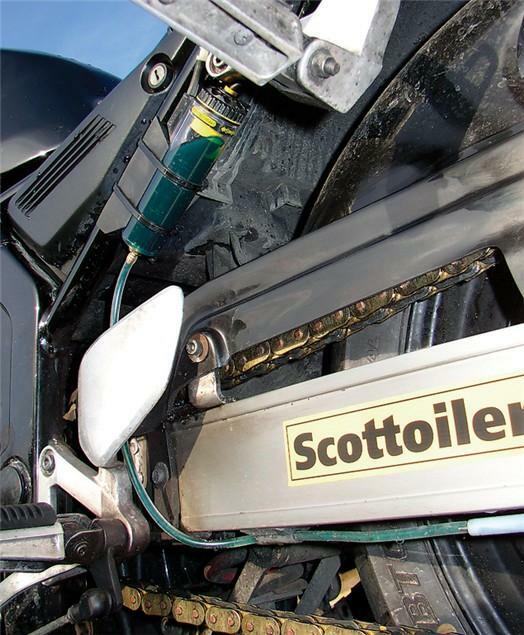 There are four different vacuum connections provided in the Scottoiler kit, which connect either to the vacuum take-off points on the bike's inlet manifolds (between the carbs or fuel injectors and the back of the cylinder), into the rubber balance pipe already in place joining each of the inlet manifolds together or, in the absence of either of the above (if any of those are hopelessly inaccesible), into the vacuum-operated fuel tap's rubber connecting hose. In the case of the Fazer shown here, all we had to do was remove one of the rubber caps on an inlet manifold vacuum take-off spigot and fit the vacuum damper assembly cap - attached to the end of the vacuum tube mounted on the RMV - directly onto it. If your bike doesn't have a fixed spigot, look for a blanking screw plugging the vacuum take-off. Undo one of those and screw in the relevant connection supplied, then fit the vacuum damper assembly tube to it. Alternatively, use the white plastic 'T'-piece to splice into either the rubber balance pipe linking the inlet manifolds (if there is one) or the take-off pipe for the vacuum fuel tap (if that's what your bike has fitted). Once done, ensure the vacuum tube is fitted neatly on its run from the inlet manifold to the RMV, and isn't kinked or trapped anywhere along its run. And that's about the bare bones of it. What we haven't detailed here is the filling, priming and setting-up of the Scottoiler once fitted, and we're not going to. All we've done (hopefully) is put your mind at rest and shown that fitting a Scottoiler isn't in the least bit difficult, and certainly not as intimidating as the apparently confusing box of bits and pieces may appear when first opened.